A-ppetite liquid food supplement for stimulating a healthy appetite. 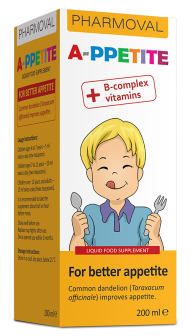 Children ages 4 to 6 years – 5 ml twice a day (one teaspoon). Children ages 6 to 12 years – 10 ml twice a day (two teaspoons). Children over 12 years and adults – 15 ml twice a day (three teaspoons). It is recommended to take the supplement about half an hour before meals.